Sleep stages. REM sleep. Deep sleep. Light sleep. What does it all mean? The curiosity surrounding the time from when we close our eyes at night to when we wake up in the morning has intrigued us since the beginning of time. We spend one-third of our life sleeping and understand that getting quality sleep is as essential to our survival as food and water. Although we know that we all need sleep, its biological purpose remains a mystery. Sleep touches every aspect of our life – from the brain to the heart to our immune system’s ability to fight disease. Understanding human physiology during sleep is essential for our health – with sleep being increasingly viewed as an important aspect of well-being, overall quality of life, life satisfaction, and more. Sleep quality and the various stages of sleep are continuously being tracked and analyzed for clinical diagnosis and the treatment of the various sleep disorders that so often plague us. We know that our brains are highly active during sleep, and we’re learning more and more about what happens once we disconnect from the outer world and dive into sleep. It’s there that we reach a new dimension of physical recovery and renewal, emotions processing, learning and memory restructuring. The ways mental and physical health depend on sleep is being extensively studied and new facts are continually being uncovered. Most of us think of sleep as a passive and relatively constant and unchanging process. In fact, sleep is a highly active state. Our bodies move frequently, and our brain activity is even more varied than it is during our normal waking state. There are two stages of existence: sleep and wakefulness. Sleep is made up of two different states: REM and non-REM sleep – which are as different as sleep and wakefulness are. Non-REM varies according to the degree of disconnection from the outer world (and other physiological processes) from stages 1 to 3 of sleep. Stage 1 is a state of transition from wakefulness to sleep; stage 2 is a more extensive disconnection with different and characteristic electrical activity of the brain; and stage 3 (also known as deep sleep) has the slowest and synchronized electrical brain activity, allowing for body recovery and growth, with the brain being purged of metabolic residues. During non-REM thinking processes remain logical and structured as during wakefulness. We can move freely, and this is also a period of recumbent rest, with respiration and heart activity being highly regular. Here we are quiet and resting, but with moving capability spared. Our brain activity is at its lowest during these stages, and our thought content is structured and analytical as during wakefulness. Heart rate and respiration are normal and temperature control is similar to what happens when we’re awake. In contrast, REM sleep is characterized by bizarre and hyper-associative thinking, dream activity that helps with emotions and memory organization, “what to remember, and what to forget”, irregular heart rate and respiration, and our bodies being actively barred from moving, as our brain blocks voluntary muscles from action, making it impossible for us to purposefully move (preventing us from also acting out our dreams). People often don’t remember much of their dreams, but they are more likely to recall some aspects of a dream if awakened from REM sleep. During REM sleep, heart rate increases, blood pressure rises, and body temperature falls to its lowest point. All in all, a complete sleep cycle takes an average of 90 to 110 minutes, with each stage lasting between 5 to 15 minutes. The first sleep cycles each night have relatively short REM sleeps and long periods of deep sleep, but later in the night REM periods lengthen and deep sleep time decreases. At SleepRate, we use the power of advanced sleep monitoring, assessment, and therapy with the latest modern technologies, to create the most reliable, effective, and user-friendly solution available today. 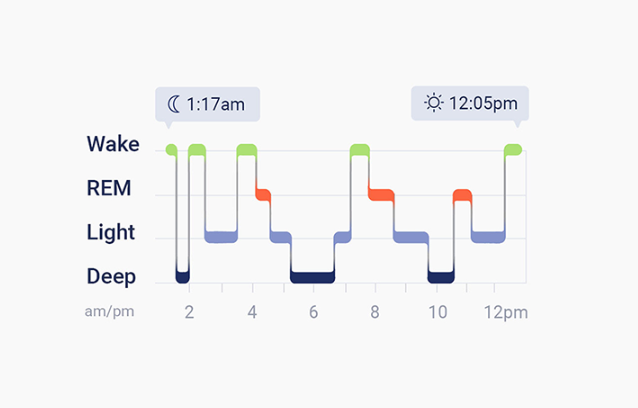 The Sleep Stages module of our SleepRate app (available in the Google Play and App Store) lets you get in-depth insights into the different stages of your sleep, including the ability to see the amount of time you spent in different sleep stages and when they occurred. As part of our advanced sleep tracking capabilities, SleepRate uses a patented algorithm that classifies wake and sleep stages using heart rate variability. This technique was developed through sleep research spanning 20 years, taking advantage of the fact that heart rhythm provides a window into the activity of our autonomic nervous system – a system responsible for all the vital involuntary functions of our body including breathing, muscle tone, digestion, and heart rate. The Smart Alarm feature also helps track sleep stages, enabling you to not only learn more about your sleep patterns, but wake up at the optimal time during your sleep cycle. Tracking your sleep stages can help you identify sleep-wake patterns and measure sleep duration, efficiency and structure. If you use SleepRate to monitor your sleep stages and its measurements suggest a condition that warrants further investigation, you’ll be prompted to consult a physician for an in-depth sleep evaluation; otherwise, the app will provide you with personalized advice on how to improve your sleep. “SleepRate’s valuable data and insights help me know when I’ve recovered, and enables my coach to give me the right training for that specific day; for example, when we look into the different stages of my sleep”. You can see Diana’s full testimonial here. SleepRate’s core technology utilizes behavioral sleep medicine practices developed and implemented at Stanford University’s Behavioral Sleep Division. Our unique sleep evaluation solution for better sleep-life balance was developed and customized as a step-by-step program to improve mental and physical performance, so that people can be more productive and effective throughout the day. SleepRate’s comprehensive all-in-one solution helps people achieve a better sleep-life balance and improve mental and physical performance – giving them the opportunity to be more productive and lead a healthier lifestyle. SleepRate provides world-class technologies that offer people anywhere and everywhere the most effective, reliable and user-friendly sleep analysis, monitoring, assessment, and therapy out there today – all in a single solution.